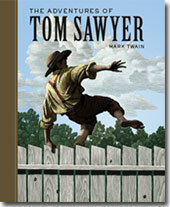 Who could forget the pranks, the adventures, the sheer fun of Tom Sawyer? It's something every child should experience and every child will love. From Tom's sly trickery with the whitewashed fence--when he cleverly manipulates everyone so they happily do his work for him--to his and Becky Thatcher's calamities in Bat Cave, the enjoyment just never ends.